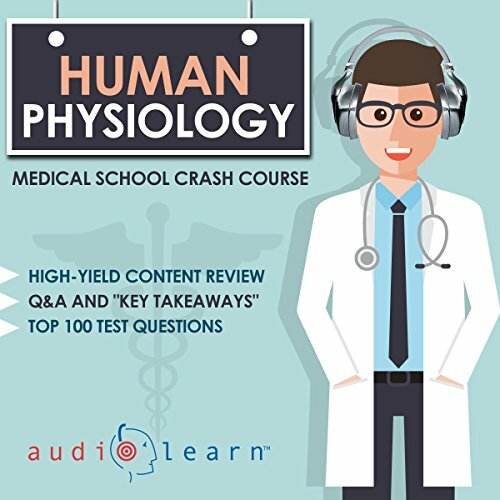 AudioLearn's Medical School Crash Courses presents Human Physiology: Written by experts and authorities in the field and professionally narrated for easy listening, this crash course is a valuable tool both during school and when preparing for the USMLE, or if you're simply interested in the subject. The audio is focused and high-yield, covering the most important topics you might expect to learn in a typical medical school human physiology course. 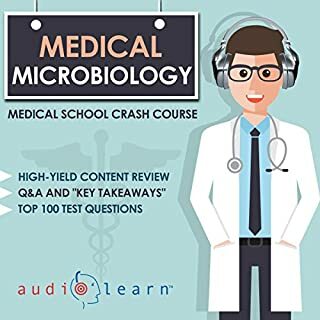 Included are both capsule and detailed explanations of critical issues and topics you must know to master this topic. The material is accurate, up to date, and broken down into bite-sized sections. There is a "Q&A" and "key takeaways" section following each topic to review questions commonly tested and drive home key points. Also included is a comprehensive test containing the top 100 most commonly tested questions in human physiology with the correct answers. AudioLearn's Medical School Crash Courses support your studies, help with USMLE preparation, and provide a comprehensive audio review of the topic matter for anyone interested in what medical students are taught in a typical medical school human physiology course. This is a very good refresher. Please go back and fix several of the glitches in quizzes. é ótimo para escutar no ônibus e carro. ótima maneira de otimizar o tempo e se relembrar de fisiologia. Content is too basic for medical school level, doesn’t go into depth into core human physiology. The track also sounds like it is a computer rather than a human narrator. sounded like the narrator just read line for line from a textbook and didnt understand any of it so couldnt deliver it in an easy to understand way or conceptualise anything. Hard to follow moving between topics, all sounded like it ran into each other and i had trouble following. It was so oversimplified that it was like glossing over concepts and like teaching me how to spell 3 letter words or it threw out complex words and concepts without explaining them so if you knew it you learnt nothing and if you didnt you also learnt nothing. Hated it so much i cant continue past the first hour. Im a junior doctor and dont think it is at all detailed enough to aid studying for usmle which they say and would be completely unintelligible and impossible to even understand for anyone without medical training who was just curious about learning medical school things which they also say its good for.